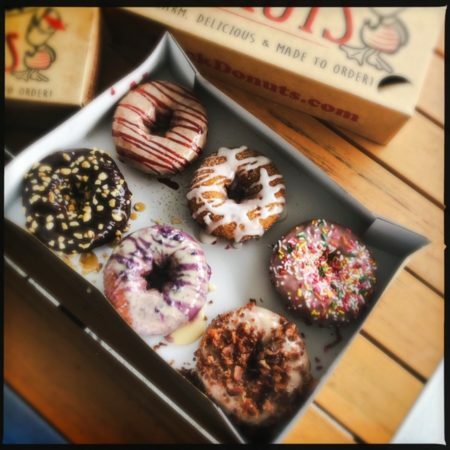 And while clearly a long-standing offering, newly opened ‘adorn at will’ donutteries, The Fractured Prune in Mt. 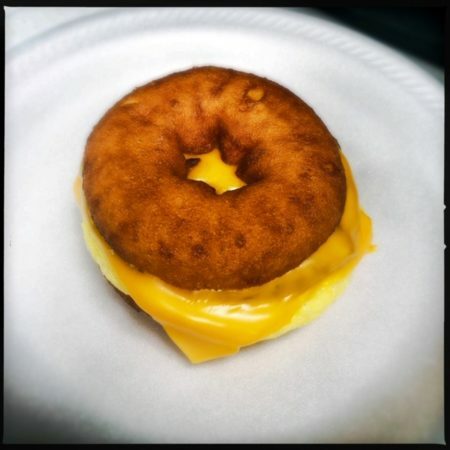 Pleasant and Duck Donuts in West Ashley, indicate the sweet, greasy rings are attempting a new stage in their evolution. Note that neither establishment offers a single gluten-free option, which I assert is a major business opportunity lost. To all concerned, let me assure you: Celiacs sufferers and those who love them are accustomed to paying extortionary upcharges for gluten-free pizza crusts, pastas, wraps, and buns. There’s certain money to be made there. Look into it. 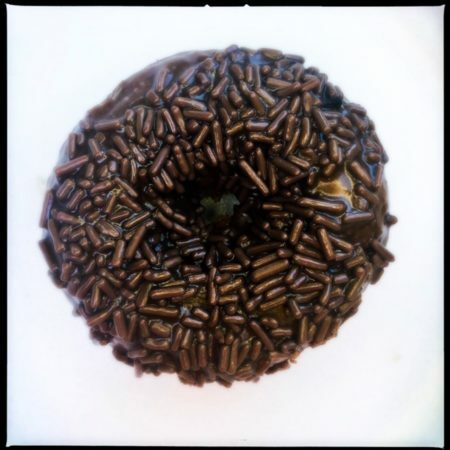 FP:“Death by Chocolate” — Chocolate glaze, chocolate sprinkles, and cookie crumbs. Barely a flesh wound by chocolate, the fundamental shortfall can be traced to the glaze. Reminiscent of Magic Shell, it’s possessed of a barely perceptible cocoa flavor. 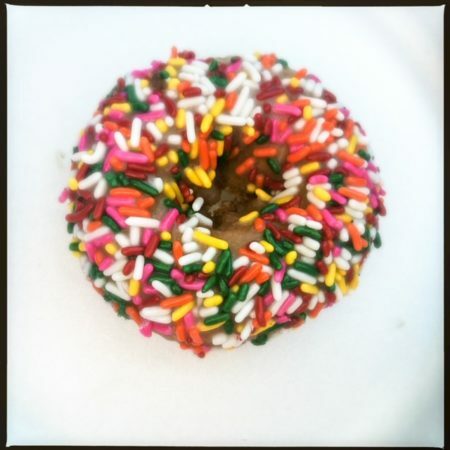 Although cute to look at, the brown jimmies don’t add much chocolate-y-ness either, and the cookie crumbs were placed on the wrong donut. Oof. FP: “OC Sand” — Honey glaze and cinnamon sugar. This one came, inexplicably, covered in Oreo-like cookie crumbs, which I later realized were intended for the DbC. After brushing them off, the assertive cinnamon flavor combines with the nutmeg-rich batter and complements it. I was told this is the most popular flavor, and it’s clear why. DD: Fresh from the fryer, the hot Duck donut reacts with the cinnamon sugar to form a crisp, crunchy exterior. Simple and straightforward, this will be my choice next time,and is certain to appeal to those less inclined toward sticky fingers or intensely jittery sugar buzzes. 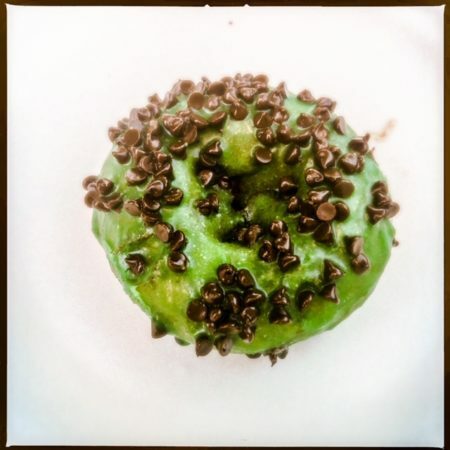 FP: “Blueberry Hill” — Blueberry glaze and powdered sugar. The artificial blueberry flavor is large and in charge here, but it’s one of the few glazes able to stand up to the ever-powerful nutmeg. If you’re not bothered by the phony notes, this was one of the favorites sampled. 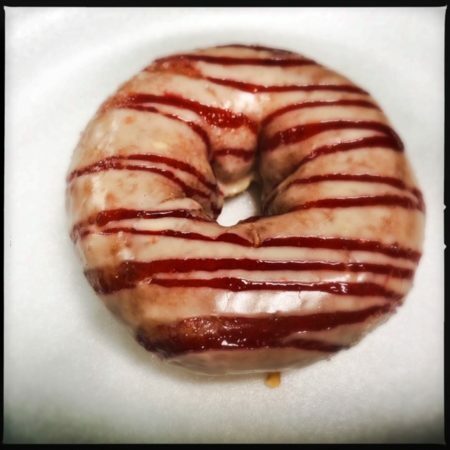 FP: “Bacon bomb” — Maple glaze, cinnamon sugar, and bacon. The bacon glaze is hard to discern and doesn’t do much as far as keeping the bacon in line. When not falling all over the place, the bits are thick and smoky, a welcome relief from the parade of sugar and nutmeg. Although somewhat unmanageable to eat, this was the fan favorite at The Prune. DD: Maple icing with chopped bacon. The maple flavor is strong here, and the icing provides good adhesion for the bacon itself. Due to the more nuanced batter at Duck, I and my companions found we no longer craved a bacon vacation and probably wouldn’t pick it as a topping again while here. FP: While the space and the multi-generational family behind the counter are charming, the nutmeg level in the recipe is too high and the steep price point is worrisome. Even with the ample donut choices and cute building, it’s hard not to worry about this little business enterprise.